Brisbane Furniture Removal & Recycling | 1-800-GOT-JUNK? Are you looking for a Brisbane furniture recycling service that you can trust? With convenient pickup appointments, upfront pricing, and responsible disposal procedures, 1-800-GOT-JUNK? 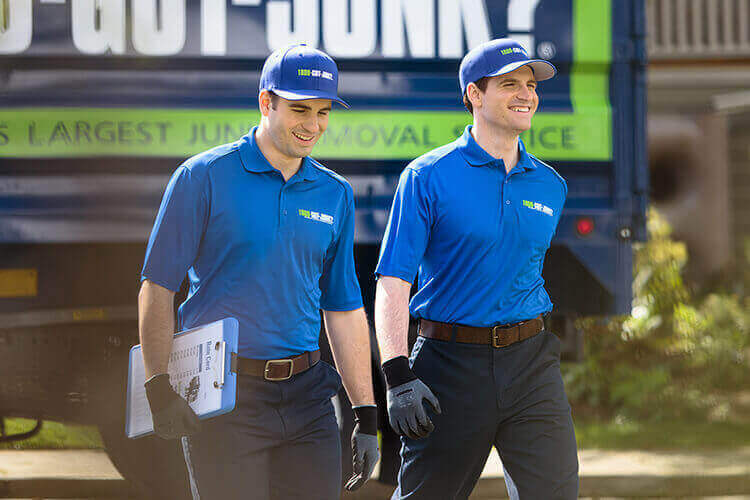 is a reliable, trustworthy brand, and we strive to provide the best junk removal service possible to residents and business owners in the Brisbane area. Learn more about how we can help you get rid of your unwanted junk. With 1-800-GOT-JUNK? you don't have to worry about receiving a bill that's larger than your quoted amount. When our crew arrives on site, they access your needs and give you an accurate no-obligation quote before they start working. If you decide to decline the quote, you pay nothing, and if you accept the quote, you pay the exact amount quoted to you without any additional or hidden fees. Also, every quote we give includes the cost of two crew members, the truck and any travel expenses, the time spent sorting through the items, and any fees or taxes required to actually dispose of the items. We have a streamlined appointment process in place to make getting rid of unwanted items as simple as possible for our clients. You can schedule your appointment via the phone or internet. All of our appointments are scheduled in two-hour blocks of time. This way, you don't spend all day waiting for our crew to show up. In fact, we completely understand that our clients have other responsibilities and lead busy lives, so a member of the crew will call you when they are in route. This gives you 20 to 30 minutes to meet our crew on site if needed. We care about the environment in Brisbane and do everything that we can to limit our carbon footprint. This means, when you dispose of old, unwanted furniture, it's not taken to a nearby landfill or dumpster. Instead, it's donated to local charity shops. Any items that aren't reusable, are sorted through to separate trash from recyclable items. This way, anything that can be recycled, gets recycled properly. In addition to removing and recycling old furniture, we haul items such as old mattresses, appliances, electronics, office equipment, and televisions. We can also haul away any construction site debris, roofing materials, carpet and flooring materials, and yard waste. Basically, our crew can dispose of any item that's able to be hauled away by two people, as long as the items aren't dangerous and don't contain hazardous materials. In addition to removing unwanted items and debris from residential properties, we have a variety of business services to help people in the Brisbane area. Our crew can do complete office cleanouts, as well as clean out privately owned real estate after evictions, foreclosures, or tenant move outs. We also offer a variety of property management services. Additionally, many of our business clients choose to hire 1-800-GOT-JUNK? instead of renting a dumpster when needed. Not only do we provide same-day service, we provide after-hour pickup and post-job sweep up services. Business owners also don't need to obtain a special permit to hire one of our crews, like the need for a dumpster rental. When you need junk or furniture removal services in Brisbane or the surrounding area, contact 1-800-GOT-JUNK?. We have a team of professionals that are happy, positive, trustworthy, and honest. Call us today to find out how we can help you.